....she lost 6 cabinet ministers as well as several junior Ministers, her Chequers agreement was torn up before the ink had dried. She seemed like a rabbit in the headlights of the extreme right-wing Tory “European Research Group” who would be quite happy to see many of our rights and our consumer and environment standards torn up. Conservative Party membership is somewhere below 70,000 and I would guess those holding ultra-right views make up a large proportion of the membership – certainly my mole in a rural Midlands Conservative Association has reported this is true there. Their situation contrasts significantly to that of the Labour Party of half a millions, and whose members’ views and experiences represent the broad swathe of Labour voters. Brexit: Parliament ended for the summer with a few hours of debate to discuss the Customs Bill and the Trade Bill ..
....which taken together, allow the government to extract itself from the EU’s trade policy umbrella and conduct its own trade deals. In the chaotic, post-Chequers mess the Government, tore up its White Paper and accepted an amendment (so no vote) that agreed there will be no post-Brexit customs border in the Irish Sea. Two more amendments tabled by Tory Brexiteers scraped through by just three votes, with the help of 4 Labour rebels after Tory Remain rebels voted with Labour, the SNP and Lib Dems. On the issue of staying in a Customs Union the Government won by a majority of 6. To date I’ve not been a very serious fan of a People’s vote – look what happened at the Referendum with neither side adequately explaining their position, and an advertising campaign on the Leave side based on absolute lies. But since the Referendum we are seeing a rolling back of Parliamentary Democracy. The government is seeking to maximise its own power and limit that of MPs and peers. So much for Parliamentary Sovereignty – one of the arguments used by the Leave Campaign. So I’m now convinced that a People’s Vote on the final deal, with different options available to vote on, including stopping Brexit, is the only way out of this mess……. · I welcomed the Law Commission report on the need to improve the Law for leaseholders, but challenged the Housing minister to commit to stopping freeholders from ripping off leaseholders. · I supported the Counsellors and Psychotherapists (Regulation) Bill, which if enacted would ban gay to straight conversion therapy and regulate all practitioners. · In response to my written question to the Housing Secretary, a minister replied that there are no plans to bring in security of tenure for those living on residential boats. · Following an approach by Brentford Football Club I’ve written to the Sports Minister to allow the club to be a trial for Safe Standing (rail seats) in their new stadium now being built at Lionel Road. 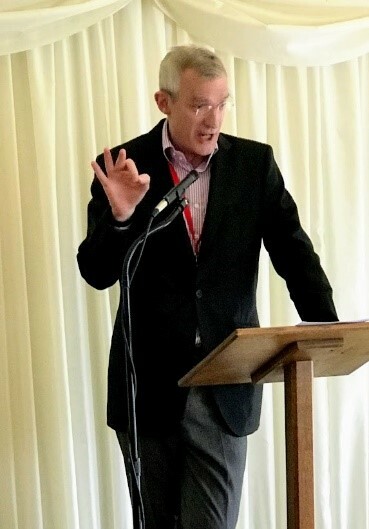 Constituent Jeremy Vine gave a funny introduction to the London Cycling Campaign Stay Wider of the Rider Parliamentary launch which I hosted. The Campaign encourages people riding bikes to report places where vehicles have passed too close to them to be safe. West Midlands Police have been leading a successful campaign to reduce close passes which has resulted in fewer accidents and a safer cycling environment. 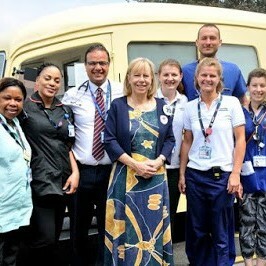 LCC are hoping the same can happen in London. · Following a campaign by MPs and staff, I’m pleased that Parliament is introducing a 25p surcharge on those buying hot drinks in disposable cups. 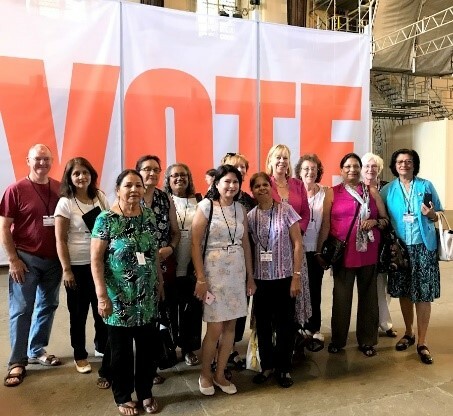 · Seema Malhotra and I met Hounslow Council’s Community Partnership Unit to understand how we all work, and how we can work closely together to understand our roles. I spoke at Migrant Voice’s campaign event which launched their report on the TOEIC scandal – another example of the Home Office’s Hostile Environment where tens of thousands of international students were summarily kicked off courses and their visas withdrawn. This was after one English language testing centre had been found to have issued fraudulent certificates to a handful of students. A legal case is ongoing, but the students are asking to be allowed to take a new test to demonstrate language competency, and those who were removed from the UK to be able to return to continue their studies. · PM asking her to back a UK net zero emissions target ahead of 2050. 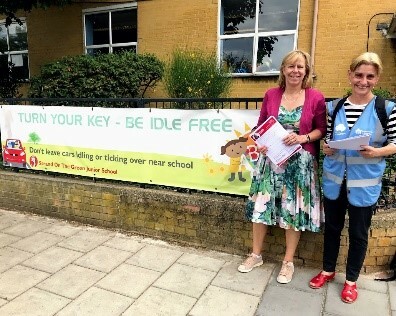 I launched my Anti- Idling campaign at the end of the summer term. We are asking parents to pledge to switch off their engines when stationary. I got a great response from parents at Strand on the Green (pictured here with Council election candidate Sally Malin), St May’s Chiswick, William Hogarth and Nishkam schools. I’ll be going to more schools with local Councillors once the autumn term starts again. 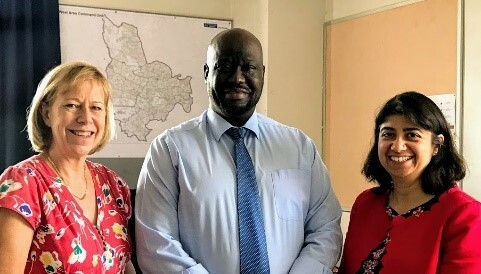 It was particularly useful to meet our new Police chief; Ch Super Paul Martin, in charge of the new 3-borough Basic Command Unit (BCU - Hounslow Ealing and Hillingdon). Having experienced race hate growing up in South London, Ch.S. Martin is determined people in West London don’t suffer what he had to. 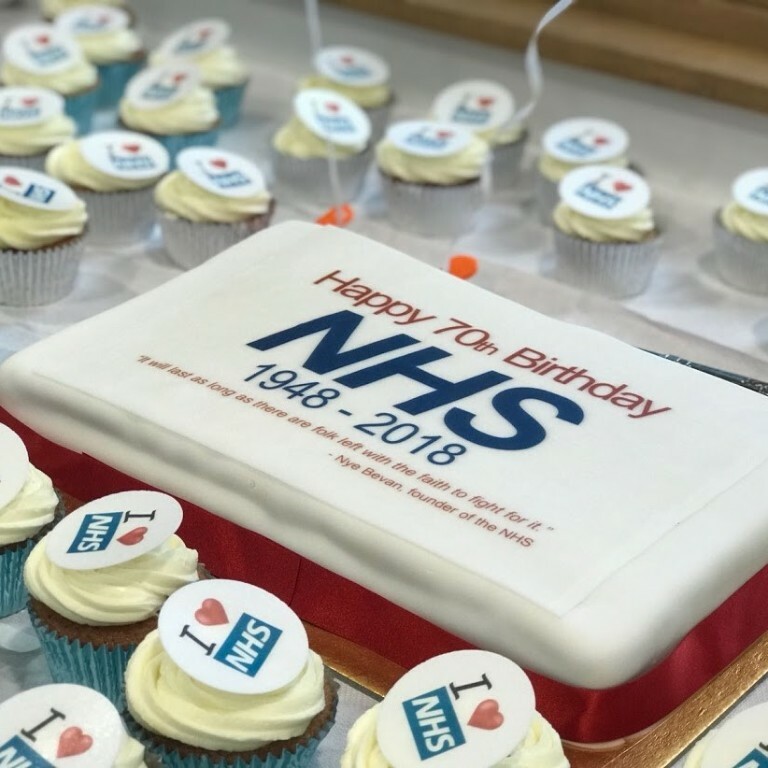 On the day the NHS had its 70th birthday I met A&E staff at West Middlesex Hospital and joined a group of local residents also born in 1948 at a tea party at Chiswick Town Hall. 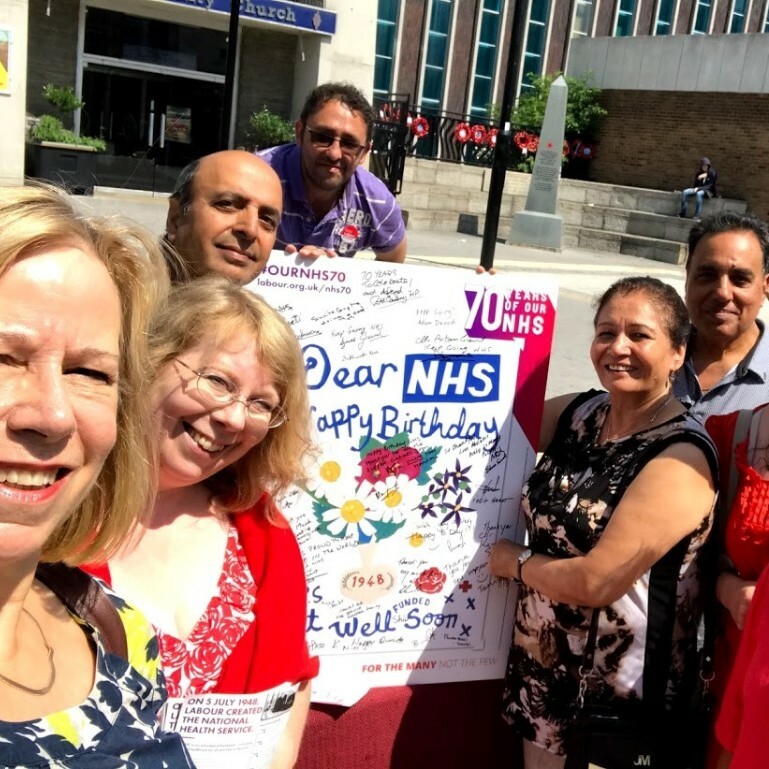 On the following Saturday we held NHS street stalls in Chiswick and Hounslow with giant Birthday Cards for people to sign. 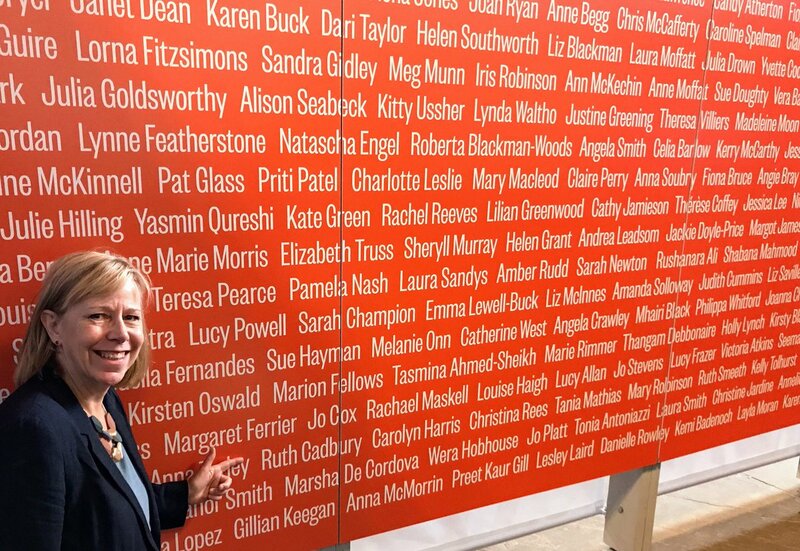 Casework: for issues to raise with me as your MP, please contact my office: ruth@ruthcadbury.org.uk Tel: 020 8581 3646 or write: Ruth Cadbury MP, House of Commons, SW1A 0AA. I hold weekly advice surgeries at the Civic Centre, please get in touch for an appointment. However many issues can be dealt with quickly be email or a phone call which saves waiting for the next available surgery.